The thyroid hormone activating deiodinase, D2, is a type I endoplasmic-reticulum (ER)-resident thioredoxin fold-containing selenoprotein. It is anchored to the ER membrane in close proximity to the cell nucleus through a single transmembrane domain. The D2 globular domain containing the catalytic active site is in the cytosol whereas only a few amino acids exist in the ER lumen. D2 is structured as a homodimer, D2:D2, and monomers are inactive. D2 has a short half-life that can be stabilized depending on whether its natural substrate T4 is available. In the presence of T4, D2 is inactivated with an approximately 20 min half-life whereas in the absence of T4 its half-life is prolonged to hours. This provides a mechanism through which the production of T3, the biologically active thyroid hormone, can be regulated according to the availability of T4. For example, an accumulation of D2 in cells increases the fractional conversion of T4 to T3 when serum T4 levels are low, such as in the case of iodine deficiency or hypothyroidism. In contrast, serum levels of T4 are relatively high in patients maintained with levothyroxine replacement therapy, and the fractional conversion of T4 to T3 is consequently reduced. D2 ubiquitination is the molecular mechanism underlying these changes in D2 half-life, i.e. the covalent attachment of multiple ubiquitin molecules to D2, which both inactivates the enzyme and targets it to degradation in the proteasomes. Ubiquitination is thought to inactivate D2 by disrupting the conformation of the D2:D2 dimer, critical for enzyme activity. A unique 18-amino acid loop confers intrinsic metabolic instability to D2, facilitating binding to proteins involved in the ubiquitination process. The ubiquitin activating enzymes UBC6 and UBC7 are critical in the process of D2 ubiquitination, as well as two ubiquitin ligases, the hedgehog-inducible WSB-1, and TEB4, a ligase involved in the degradation of proteins in the endoplasmic reticulum. Ubiquitinated D2 (UbD2) is not immediately taken up by the proteasomes. 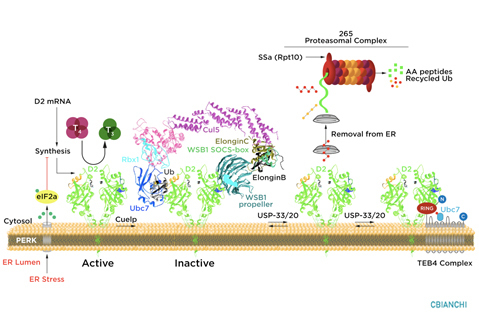 Instead, UbD2 can be reactivated by de-ubiquitination, a process catalyzed by two USP-class D2-interacting de-ubiquitinases (DUBs), USP-20 and USP-33. The other two deiodinases, D1 and D3, are not known to be ubiquitinated or undergo post-translational modifications. D2 ubiquitination occurs via K48-linked ubiquitin chains and exposure to its natural substrate, T4, accelerates UbD2 formation. UbD2 is taken up by proteasomes located in the cytoplasm. D2 retrotranslocation to the cytoplasm occurs via interaction with the p97-ATPase complex. D2 retrotranslocation also includes deubiquitination by the p97-associated DUB Ataxin-3. Once in the cytosol, D2 is delivery to the proteasomes as evidenced by coprecipitation with 19S proteasome subunit S5a and increased co-localization with the 20S proteasome. D2 ubiquitination may occur at different rates depending on the cell where D2 is expressed. As opposed to the rest of the body, D2 in the hypothalamus is poorly ubiquitinated (or greatly de-ubiquitinated) sustaining conversion of T4 to T3 despite interaction with T4. As a result, TRH and TSH secretion are highly sensitive to serum T4. This also explains why serum TSH is normalized in many levothyroxine-treated patients even as serum T3 levels remain below the normal range. Browse through the list of Recent Publications to find original studies that describe these mechanisms.